AIIMS Bhopal Nursing Officer Jobs Recruitment Examination 2018: All India Institute of Medical Sciences AIIMS Bhopal has given employment notification for the recruitment of Nursing Officer and Senior Nursing Officer posts. Candidates have to qualify BSc in Nursing to apply for these AIIMS Bhopal Nursing Officer vacancies. 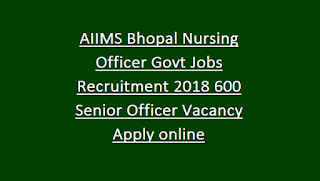 AIIMS Bhopal has released 0 Senior Nursing Officer and 600 Nursing Officer jobs vacancies through written Examination. Online Registration of applications starts from 08-10-2018 and last date is 29-10-2018. 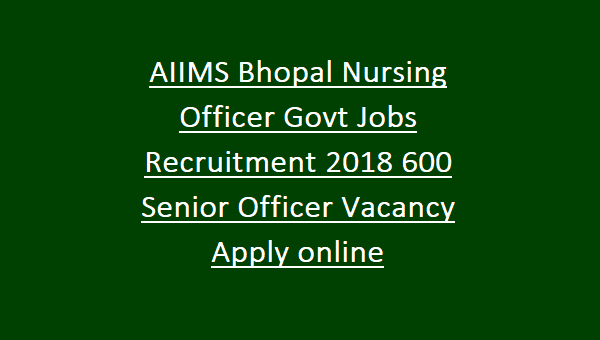 Interested candidates can apply online for AIIMS Bhopal Recruitment of Nursing Officer vacancies using the official web link @ www.aiims.edu or http://www.aiimsbhopal.edu.in/. Candidates will be recruited for AIIMS Bhopal Nursing Officer Jobs is based on written examination. Written exam will be conducted on 07-12-2018. Complete details regarding All India Institute of Medical Sciences AIIMS, Bhopal Recruitment 2018 Nursing Officer Jobs- Application procedure, Pay scale, Examination fee, Age details, qualifications, Important Dates, Examination centres and other updates see the advertisement. AIIMS Online application registrations starts from: 08-10-2018. All India Institute of Medical Sciences, Bhopal has released total 600 Nursing officer vacancies. Candidate with BSc in Nursing or Diploma in General Nursing Midwifery from a recognized University or Institute or Board or Council. Please see the AIIMS notification for qualification info. Age limit for AIIMS Recruitment vacancies is between 18 years and 30 years as on notification released date. Upper Age limit for SC/ ST is 35 years, for OBC candidates is 33 years and for PH (one leg) is 40 years. AIIMS Recruitment selection is based on written examination. Written exam will be held in major cities of India conducted on 07-12-2018. Download the Admit card from AIIMS website @ www.aiimsexams.org. Candidate should bring admit at the time of AIIMS written test. After the declaration of Written Exam results candidates will be called for Certificate/ Documents Verification. Interested candidates are advised to apply for Nursing Officers vacancies using the AIIMS bhopal recruitment link @ www.aiimsbhopal.edu.in Online registration of Applications available from 08/10/2018 to 29/10/2018 on AIIMS Bhopal website. Applicants are required to keep a copy of registration slip and payment proof for future record.